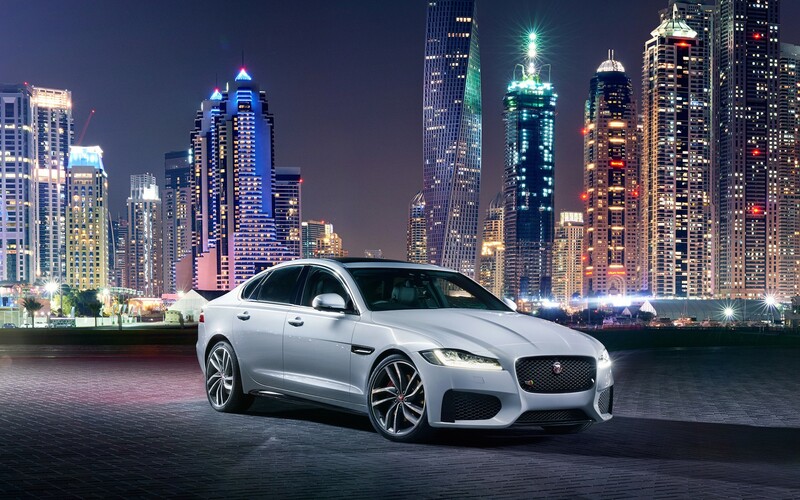 With its redesign for 2016, the Jaguar XF follows the full size XJ and the new XE into the house of aluminum. In addition to the attendant weight loss, the new XF also sees a major increase in its tech offerings, while its engine lineup is sharply reduced. The switch from an all-steel structure sees the mid-size luxury-sport sedan, which first made its debut in 2009, shed considerable mass. Jaguar is quoting a 132-pound weight loss for the rear-wheel-drive model and an impressive 265-pound cut for the all-wheel-drive version. Helping matters is the fact that the car has not grown any larger. The overall package size is retained, but the car’s wheelbase grows by two inches. The wheelbase stretch yields more rear-seat room, a welcome development. However, Jaguar is claiming bumps of less than an inch in rear-seat knee- and legroom, which is less than we might have hoped. The new styling is largely evolutionary, not surprising given that the previous car ushered in Jaguar’s current design language. Although the whole car is new, the most noticeably fresh elements might be the headlights (available as full LEDs), the taillights , and the elongated greenhouse that now includes quarter-windows in the C-pillars.